The uncertainties are large due to the short length of robust observations, and because ARGO only samples down to 2000 metres — less than half the average depth of the global oceans. Although the deep ocean will have absorbed far less heat the the surface ocean it cannot be neglected in order to adequately balance the Earth’s energy budget. See: SkS post: Ocean Heat Content And The Importance Of The Deep Ocean. The huge margin of uncertainty and the disparate heating rates between the three ocean heat data sets vindicate Kevin Trenberth’s appeal that “we (the scientific community) must do better”, but they will improve as the length of the observational record grows, and if proposed deep ocean observations, such as Deep Ninja, are put into place. And perhaps most crucially of all, the persistent energy imbalance at the top-of-the-atmosphere (TOA) is representative of future global warming, or warming “in the pipeline.” The Earth will continue to warm until the balance at TOA is restored. Increased concentrations of greenhouse gases, from the burning of fossil fuels, slows the loss of heat from Earth’s atmosphere to space. This creates an imbalance between incoming solar energy and outgoing heat. The Earth will continue to warm until the balance is restored. An apparent mismatch between the modeled estimate and the heat that could be accounted for on Earth, led to well-known climate scientist, Kevin Trenberth to lament that it was a “travesty.” Trenberth was, of course, referring to the inadequate state of global observations, such as the sparsely sampled deep ocean among other things, but his comment was predictably distorted by misinformers and spawned a fake-skeptic climate myth of its own. Loeb (2012) takes an updated look at the issue and finds that, using observations rather than modeled estimates, the Earth’s energy imbalance is consistent with heat building up with the Earth system. They have this imbalance at 0.5 (±0.43) W/m2, much smaller than previous estimates, but the error margins are huge. Not unexpectedly the authors confirmed that heat is continuing to build up in the sub-surface ocean, which agrees with other recent studies on ocean heat [see top figure]. The persistent energy imbalance measured by this study is essentially future global warming, or “warming in the pipeline”. It puts [to rest] wishful thinking-based claims that global warming has halted. Earth’s energy budget is determined by measuring how much energy comes into the Earth system from the sun, how much is lost to space as heat, and accounting for the remainder on Earth. Very little of this Earthbound energy goes into warming the atmosphere and land because they have a limited capacity to store heat. Likewise the energy required to melt ice is comparatively small. The oceans, however, cover over 70% of the Earth’s surface, are dark-coloured (meaning they absorb sunlight readily) and, due to their enormous heat capacity compared to that of the atmosphere and land, store over 90% of the excess energy from global warming. Quite obviously then, accurate measurements of ocean warming are crucial to balancing Earth’s energy budget. The ARGO float network consists of 3000 autonomous devices, distributed around the world’s oceans, that sink down to depths of up to 2000 metres taking measurements of ocean temperature as they ascend up through the water column. 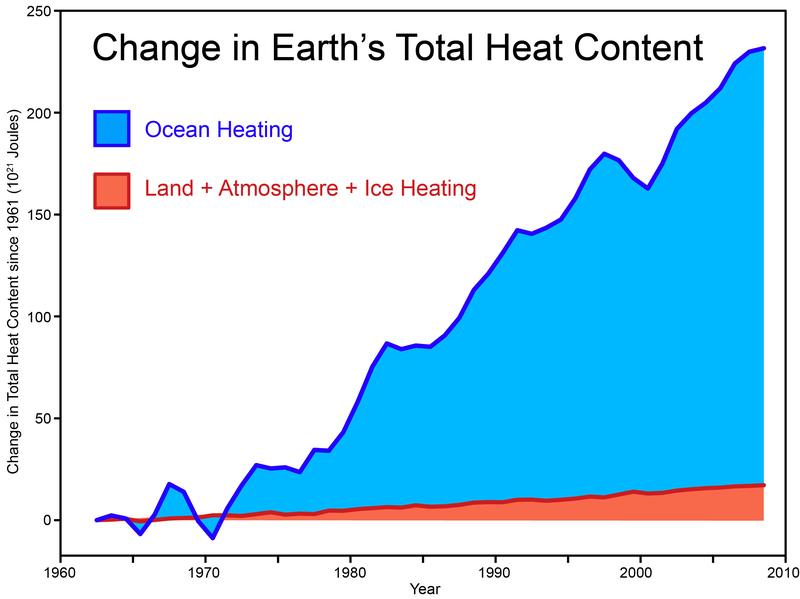 The system began to be rolled out in 2000, and by 2003 made up the majority of ocean heat measurements. The full roll-out of the 3000 floats was completed in late 2007. Although ARGO has not been without it’s fair share of problems (as with any new technology), it represents a vast improvement over previous methods of sampling subsurface ocean temperature, such as the expendable bathythermographs (XBT’s). These are ship-launched devices that unfurl a trailing a copper wire as they descend down into the depths. It’s through this wire which temperature information is transmitted back to a data collection system onboard the ship. Unlike the ARGO floats, XBT’s don’t have pressure sensors to measure depth, instead this is calculated by the rate at which the XBT falls. This calculation is carried out by software embedded in the XBT, and this timestamping of the temperature data is how depth is determined. Unfortunately this method has led to numerous problems in the ocean heat content record. See Abraham (2011). From 1990 to 2002 these XBT’s made up the bulk of ocean heat measurements, however because they were sparsely sampled in both time and space, numerous corrections and mapping strategies have had to be employed to remove errors and bias from the data set. From around 2002–2003, during the transition from XBT to ARGO, global ocean heating seems to decline. See figure 2. The light green area I’ve highlighted (in figure 2[a]) is the time period where the XBT were the dominant source of ocean heat content data. During 2003, when ARGO takes over as the major source of data, it’s clear that the large year-to-year fluctuations abruptly shrink — an indication that the large variation was not real, but most likely a result of errors in the less accurate XBT-based system. Also notable is the substantial variation in ocean heating rates between the three different ocean heat content data sets. In figure 2(b) are shown the ocean heating rates for the three data sets and their uncertainties. The period where ARGO data makes up the bulk of data (2004–2008 in red) has a greater uncertainty only because their period of observation is much shorter (5 years), versus 11 years for the interval where XBT data predominates (1993–2003 in blue). These uncertainties in ARGO will diminish as the length of the observational record grows, and indeed a decline in the scale of the annual fluctuation seems be occurring even within the 2004–2008 period. As mentioned in the introduction, the satellites which measure incoming and outgoing radiation at the top of Earth’s atmosphere (TOA) cannot measure the small planetary energy imbalance brought about by global warming. It is over a hundred times smaller than the energy coming and going from the Earth. But, despite lacking absolute precision, the measuring instruments aboard the satellites are very stable. Therefore the large fluctuations at the top-of-the-atmsophere during ENSO (El Niño/La Niña) present another approach to tracking changes in Earth’s energy imbalance. Figure 3-Variations in TOA radiation and ENSO during the past decade. a,b, Anomalies in net radiation (NET), absorbed solar radiation (ASR), the negative of outgoing longwave radiation (-OLR), and two-month averages of the Multivariate ENSO Index (MEI) for 30 S–30 N (a) and globally (b). Positive/negative anomalies correspond to a gain/loss of Earth energy. Positive and negative values of MEI correspond to El Niño (red shaded) and La Niña (blue shaded) conditions, respectively. TOA radiation anomalies are determined from monthly averages by removing the seasonal cycle then smoothing with a twelve-month running mean. Adapted from Loeb (2012). In order to compare these satellite-based observations with ocean heat content it is necessary to anchor the data to an absolute scale. Rather than use a model-based estimate, as did Hansen (2005) and Trenberth (2009), the authors achieve this by calculating it from observations of ocean heat content (down to 1800 metres) from the PMEL/JPL/JIMAR data sets over the period July 2005 to June 2010 — a time period dominated by the superior ARGO-based system. By combining the ocean heating rates, TOA observations (figure 4) and other energy storage terms (land, atmosphere warming and ice melt), the authors calculated Earth’s energy imbalance from January 2001-December 2010 to be 0.5 (±0.43) W/m2. Figure 4 — Comparison of net TOA ﬂux and upper-ocean heating rates. a, Global annual average (July to June) net TOA ﬂux from CERES observations and 0–700 and 0–1,800m ocean heating rates from PMEL/JPL/JIMAR. Uncertainties for upper-ocean heating rates are given at one standard error derived from OHCA uncertainties. b, Net TOA ﬂux from CERES, ERA-Interim reanalysis and the one standard deviation about the 2001–2010 average of 15 CMIP3 models (grey bar) are anchored to an estimate of Earth’s heating rate for July 2005–June 2010. From Loeb (2012). An obvious feature of the satellite TOA observations (figure 4) is that they do not show a sharp decline between 2002–2005 — the time of the transition from XBT to ARGO. Again this suggests that the scale of the ‘slowdown’ over that period is simply an artefact of the changeover from one system to the other, and may not be real. While the TOA observations show far less agreement with the NODC and Hadley Centre OHC data sets, after 2004 they demonstrate moderate agreement with PMEL/JPL/JIMAR data sets (as determined by statistical analysis). — by Rob Painting, originally published at Skeptical Science.